CAGAYAN DE ORO CITY (MindaNews/20 December) — New People’s Army rebels released two police officers they had held captive since last month hours after President Rodrigo Duterte declared a unilateral ceasefire with the rebels for the Christmas season. Chief Inspector Renel Serrano, Philippine National Police Caraga spokesperson said rebels from NPA Guerrilla Front 16 released the two policemen in Sitio Tiltilan, Barangay Mahanob, Gigaguit town in Surigao del Norte Wednesday afternoon. Police Officer 2 Jhon Paul M.Doverte and Police Officer 2 Alfredo L. Degamon, were abducted by the rebels while they were manning an outpost in Placer town, also in Surigao del Norte last Nov. 13. 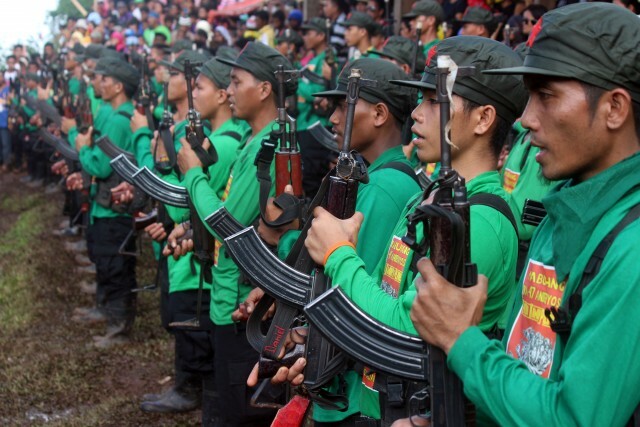 Serrano said the NPA rebels turned over the police officers to Surigao del Norte Vice Gov. Arturo Egay and Surigo City Vice Mayor Alfonso Casurra at around 1:30pm in Sitio Tiltilan. The release came after President Duterte declared a ceasefire with the rebels in the spirit of Christmas. “The President announced last night a suspension of military operations from December 24 to January 2, 2018,” Presidential Spokesperson Harry Roque said in a statement. In an earlier interview with reporters in Manila, Duterte said he wanted the public to feel safe during the Christmas festivities. Capt. Patrick Martinez, spokesperson of the 4th Infantry Division said they will abide with the President’s directive and will order all the Army units in their command to stand down starting on Dec. 24. “Many of our Army units will immediately stop their operation against the rebels,” Martinez said. “We are eager to see if the NPA rebels will reciprocate the peaceful gesture of our President,” he added. Supt. Lemuel Gonda, PNP 10 spokesperson said municipal police stations will maintain the highest level of alert during the duration of the ceasefire. “We’ve shut the doors for now to any ongoing peace talks. I am not in a position to say that the doors will forever be shut. We need to see sincerity on the part of the CPP-NPA. Show us that you are sincere and I’m sure the president will act accordingly,” Roque said on Nov. 28. Duterte issued the unilateral ceasefire declaration for the holidays even if he had declared the CPP-NPA-NDF as a terrorist organization on Nov. 23.